Rapid solidification is a further optimization on basis of spray forming process(also called spray deposition), it is similar with atomization comminuting process, it is a metal forming process that spews molten, atomized metal at a rotating substrate to form a metal ingot or billet. The high solidification rate of the process results in the relative density reaches above 99.2%.After following hot working(forge,roll,extrude or HIP),the materials are machined to be dense products. Compared to conventional technology, rapid solidification has the features of high precision,homogeneous microstructure, excellent properties and low cost,widely used in many high-end fields, such as electronic information engineering,biomedical devices,auto parts,machinery,weapons and aerospace industry etc. 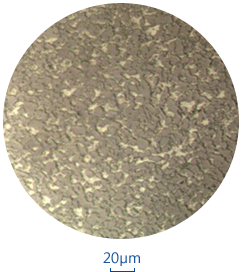 Due to the rapid solidification process,the materials offer many advantages,such as homogeneous composition,refining microstructure,no macrosegregation and low oxygen content.Compared to conventional casting,forging and powder metallurgy process, rapid solidification technology could produce the alloys not to be realized by casting with short production routes,simplified processes and high deposition efficiency.It is not only a blank preparing technology,but also the direct metal parts manufacturing process.Until now, rapid solidification has become a hot point in the development and applications of world new materials. Superior strength, magnetic, and corrosion properties due to high density achieved when compared to conventional powdered metal, plastics and die-casting. Capability to create alloys that are not available in wrought or cast form. 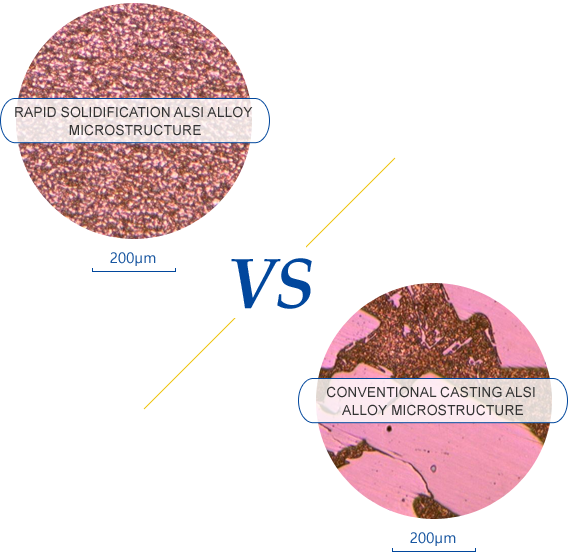 From the the pictures above:Baienwei AlSi alloys present equiaxed shape,while while conventional casting AlSi alloys present dendrite shape,which greatly enhances the overall performance of material. 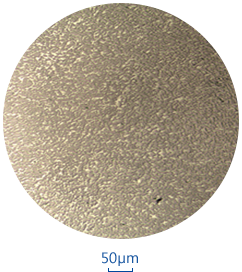 From the micrograph 200 times of the high silicon aluminium alloy, silicon distributes evenly, alloy structure is dense. The silicon of the high silicon aluminum alloy is composed of different sizes of silicon particles. The size of big silicon particle is about 10μm,and the size of small particle is under 5μm.